The late evening 1 & 1A services will effectively be combined. The 22.00 Service 1 from Royal Parade will be withdrawn but the 21.30 and 22.40 Service 1A will be extended to cover St Stephens after serving Latchbrook, operating via Church Road. The 21.56 from Latchbrook and 22.04 will be the last journey into Plymouth. The 23.00 from Royal Parade and the 23.26 from Mount Batten are being withdrawn. The 22.10 and 23.10 from Royal Parade and the 22.30 and 23.30 from St Budeaux are being withdrawn. Evening services from the 18.35 are slightly retimed to run five minutes later with the journeys departing Royal Parade at 20.05 and 21.05, diverted via the Torpoint Ferry. This is to enable passengers wishing to get to Torpoint to do so by travelling as foot passengers on the ferry. The service is being withdrawn due to declining passenger numbers. Customers on this service do have an alternative operator. At points on the route customers can take a short walk to catch our services 1/1A and 76 on Alma Road and Wolsely Road and service 3 onSaltash Road and Keyham Road. Journeys after the 20.30 departure from Royal Parade and after the 19.43 from HMS Raleigh are being withdrawn. Passengers travelling between Torpoint Ferry and Plymouth city centre can travel from Torpoint Ferry (Devonport side) on the diverted Service 3 which will operate via the ferry terminal from 20.10. The "short' 93 journeys which currently operate between Elburton Hotel and Plymouth city centre will be withdrawn. The journeys to Plymouth starting and finishing in Yealmpton, Kingsbridge and Dartmouth are not affected. The timetable is being revised to provide faster journeys between Callington and Plymouth. Most peak journeys will continue to serve Ashton and St Dominick with some continuing to serve the Burraton Industrial Estate. 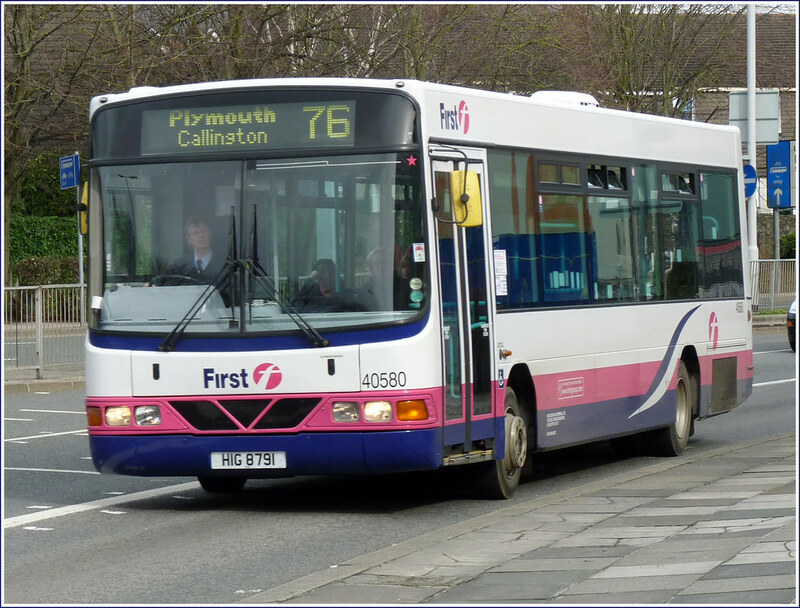 Following requests, a new service connecting Tavistock and Callington Community College is being introduced with one return journey each day on school days. So I guess this releases a few more buses which can be sent up to Somerset. At least they will gain a nice new coat of paint! The Wright Order For The Seven In my personal opinion, the Gemini 3 is a vehicle that has it's perks but also has quite a lot of downs too. As the generations of Gemini's progressed, I think the quality of the vehicles have gotten worse. Livery Delivery : Revisions Decisions  With just a hint of First corporate identity in shadowy diagonals, the "official" font for "we" and "Southampton" and a barely visible First name plus logo, you could be forgiven for thinking that the City was back as owners. But no doubt that's the whole idea. Livery Delivery : Revisions Decisions  "We opted for animal prints, and a leopard print was our obvious choice. Animal print branding is quite 'in vogue' at the moment as there are other business elsewhere in the country who are also opting for something a little bit on the wild side." Newcastle upon Tyne It had been far, far too long since I'd been to Newcastle, not least because of Go North East's explosion of liveries but because it is a fascinating city of fine bridges with spectacular views over the River Tyne, plus the warmth of the citizens. It also has two major bus stations, right next door to each other and with a spot where you could easily capture buses leaving Arriva's Haymarket Bus Station and those entering the more generally-used Eldon Square neighbour. Rail operators axe designated areas because they 'cause rows between passengers' Staff are said to be finding it difficult to mediate between customers when the tranquil haven is spoiled by those who insist on using noisy gadgets, talking loudly, singing or drinking alcohol. Looking back... Torquay in '73 - part 2(RECOMMENDED POST!) This week our regular guest blogger Philip Slynn returns with another enjoyable three part Looking back... feature, this time taking in somewhere a bit further from home - photographs taken on a holiday in Torquay in '73. All the good news seems to come from First Kernow these days. How times change! Yet they are still looking for drivers! What is going on?? The fact they are taking on drivers suggests to me they have got a long term plan for Plymouth and need more drivers. Just because they axe 1 route and cartail a few evening services does not mean it's the end. Seems to me they are making sensible decisions in order to keep the routes they have profitable whilst maintaining lower fares. What's the connection? Every bus company in the country needs to recruit for retirements, general turnover etc. if they're expanding then they need more. I heard that new drivers at first are only being offered 3 month renewable contracts. That doesn't sound like long term commitment to me. Anon 1 Aug 1857. Load of rubbish. Be wary who you speak to. First relaunching park and ride in September with new front livery. 08 enviro sporting re spray this morning on pawl and ride stand. First have not lost the habit of putting route-branded buses on the wrong route. A week or so back I saw a purple bus clearly labelled to the effect that all journeys were £1 - but it was in Keyham on the 4. Would I be entitled to get on it and insist on paying only £1 - Trades Descriptions and all that? The seller (FDC in this case) is under no obligation to sell something at an advertised price. Any such advert is an "invitation to treat" – see http://en.wikipedia.org/wiki/Invitation_to_treat. First have been route branded buses on the wrong route for years but everytime I mention it I am shouted down by First lovers who say its better to have a bus turn up that no bus at all. That is not the poin twhy brand buses for a special route if you are not able to operate them on that route. It rarely happens with other bus operators in this area. Keith. Dont be silly. If you were on a Park and Ride bus expecting to go to Coypool, would you be surprised if it ended up in Dartmouth, just because it was branded for Service 93. Route branding simply makes the allocators life more difficult. A bus is a bus, is a bus.